PEX is affected dramatically by the temperature of the water flowing through it. It can expand something like a quarter inch for every foot of length for each rise of 10 degrees. So you can see if you have a long run the expansion and contraction can be very dramatic - measuring in feet. The way to manage this expansion in PEX pipe length is to create adequate slack in your lines. This is generally accomplished by placing a loop in the line as shown in the picture. Most of the PEX you will likely be using will be 1/2-inch so make your holes at least 3/4-inch in your joists and studs. 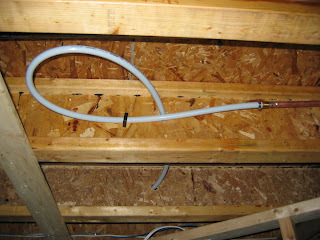 That way the PEX pipe can easily move when it expands and contracts. An added bonus is that a bigger hole makes it easier to install as well. I like to use the 3/4-inch clips to secure the 1/2-inch PEX pipe. It keeps the pipe in place but also allows free movement through the clip for expansion and contraction. Plus if you are like me I do not quite get the position right and a looser clip makes it easier to make adjustments. BTW: I found the exact-fit clips, that would be 1/2-inch for 1/2 pipe, tend to scratch the pipe if you try to move the pipe through the clip. This is not a good thing as it is creating a potential weakness in the pipe that could leak latter.